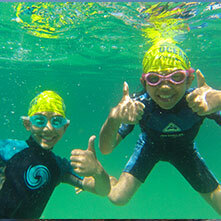 The Husky Hop ocean swim is a point to point 1 km, 3km and 5 km open water swim in the pristine waters of Jervis Bay. Each race will be divided into sections broken up by checkpoints. Competitors must exit the water at each checkpoint and collect a wrist band to ensure they have completed the full course. All swimmers will return to the finish line at Husky beach. The Husky Hop 1km will start from the beach at Moona Moona. Swimmers will go out around the designated buoys and return to the finish line at Husky Beach. The Husky Hop 3km will start at Collingwood Beach. This swim is divided into two stages with one checkpoint at the 2km mark (Moona Moona beach) before heading to the finish line. The Husky Hop 5km will start at Vincentia Sailing Club. This swim is divided into 3 stages with two checkpoints. The first checkpoint is at the 2km mark (Collingwood beach). The second checkpoint 4km mark (Moona Moona beach) before heading to the finish line. The Husky Hop 5km will be Race 1 of Australia’s largest open water swim series co-ordinated by Swimming NSW. Overcast starting in the evening.